I am so excited about this make; It is none other than Liberty pyjamas! 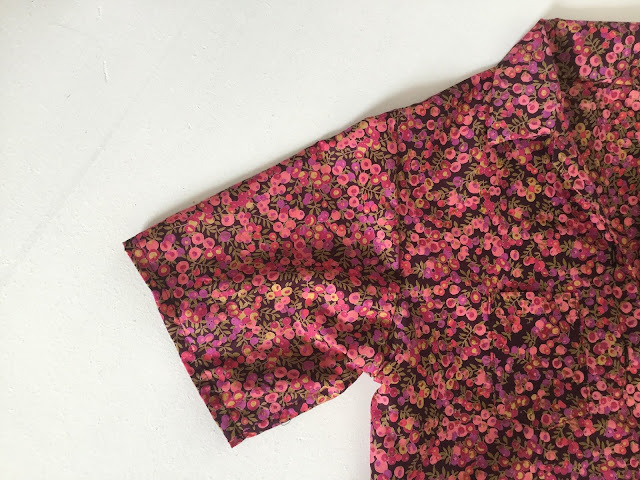 Sewing with Liberty for me, like many people, is a huge luxury, so I'm very pleased to have a pair of Liberty pj's. I got this Liberty fabric from the Birmingham rag market for just £8 a metre (I talked about all of my fabric purchases from Birmingham here if you're interested) which was an extremely good price for Liberty! However, gorgeous as it is, Liberty fabric is quite bold, and I knew that if I made it into a top I would rarely wear it. I didn't want it just sitting in the cupboard for ages though, so I cut into it soon after I bought it, and pyjamas solved the problem of what to make! 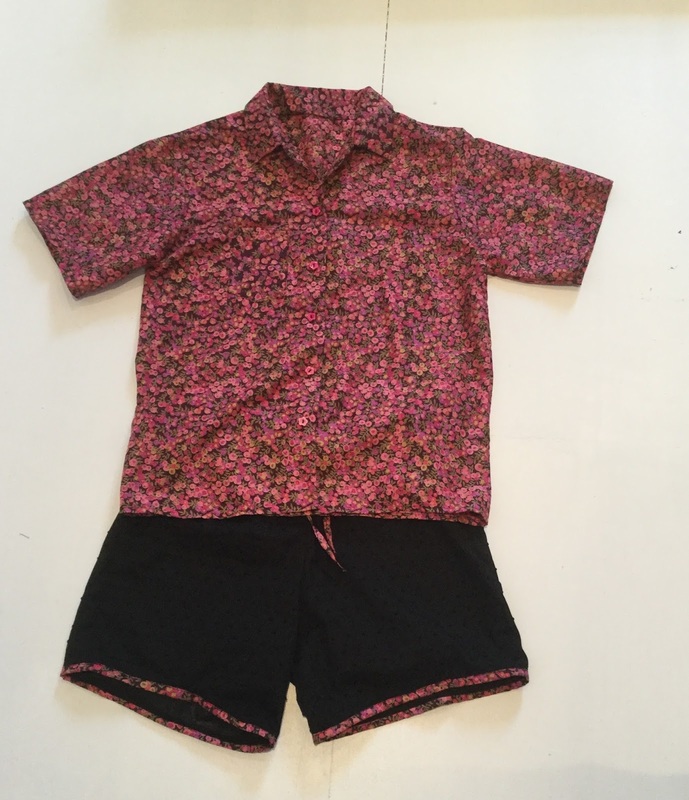 I don't have any 'proper' pyjamas, as in button down shirts, and that was what I wanted to make. I 'drafted' the pattern for the shirt which is something that I'm quite proud of as I wasn't sure I'd be able to do it. When I say 'drafted' I mean I copied the pattern from an existing shirt, but I still had to make sure that each piece fit together and was sewed in the right order, so it counts as drafted in my books! Extra details that I added are a small pocket and pink flower buttons, which although you can't see very well look very lovely! One of the benefits of not making a garment to wear outside is that you can add fun extra details like buttons in the shape of flowers (which also happen to fade in a pink gradient as you get to the bottom of the shirt!). This shirt was actually really quite to make, compared to say my Fairfield button-up or my Rosa shirtdress. For a shirt it is actually incredibly easy, with just a few pattern pieces. I didn't interface anything as I wanted the pyjamas to be soft, and I added button and collar facings, which I think adds a nice touch of luxury. If you're looking at making pyjamas like these but would rather buy a pattern, I'd recommend the Carolyn pyjamas by Closet Case Files, the pattern that I would have bought had I not felt that I'd be able to draft it myself, which is much cheaper than buying a pattern. This is definitely not going to be the only one of these I'm going to make, and I'm longing to add piping in my next one! 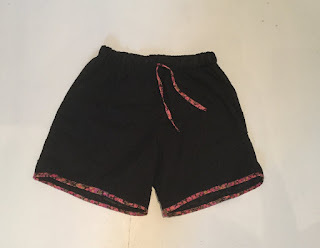 For the shorts, I used the Margot pyjama pattern from Love at First Stitch, and hacked it to make shorts. 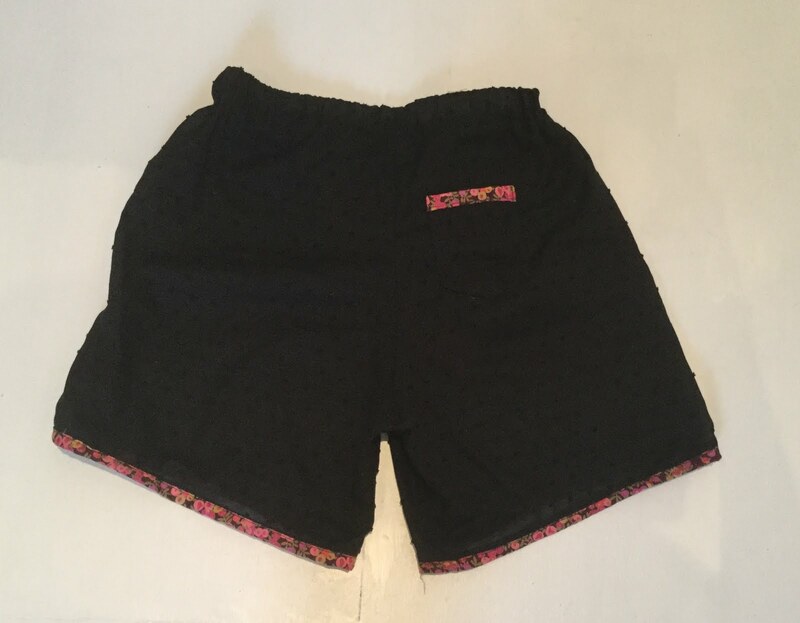 I wasn't sure which fabric to use for the shorts, but my Mum found this perfect black lobby fabric by Robert Kaufman at John Lewis. It doesn't show up on the photos but it has a lovely texture to it. To add some interest, I put some bias-binding made with the Liberty fabric around the bottom hem, as well as a Liberty drawstring at the front. On the back I added a pocket with a Liberty trim around the top, which is similar to on these pyjamas that I made. I really love this pyjama ensemble, they are just perfect for the summer and it feels very special to sleep in Liberty! Your pj's are fab! Your good, drafting it all by yourself. Collar and all! I never made any pjs for myself, or anyone else, but it is definitely something I'd like to tackle one day. I'd probably go for long bottoms and a knit top. I have rather enjoyed making lots of t-shirts this summer. I have just cut into a tiny piece of liberty fabric for my quilt. It wasn't big enough for anything else. I have had a liberty print on my wish list for a long time but so far, the wish has been ignored... happy sewing! You are a very talented sewist! I started sewing at a young age and made my first pair of jeans (long before you were born!) and continued on to make most of my wardrobe, until getting married and then life got too busy. I hope you continue to sew and make lots of wonderful pieces. The sky is the limit! Very cute! I really love Liberty fabric. They are good for summer night.